Today the Asgard reappear and then everyone puts a knife in each other’s back. Picking up immediately from the previous episode Teyla is attempting to evacuate the central tower when the control room goes boom, leaving nothing but rubble. It turns out that both Sheppard and Zelenka survived by taking cover on the balcony at the last moment. On the Daedalus Todd’s takeover of the ship is complete where he announces his intention to take the ship back to the city. During the journey back Todd decides to question Woolsey, who denies involvement in what’s happened, before contacting the city and threatening to start killing the crew unless Sheppard shuts off the Attero Device, refusing Sheppard’s claims they don’t have it. Sheppard instead offers up the address where Meredith and Daniel were taken which Todd accepts before leaving with the Daedalus. Deep in the bowels of the ship however Ronon and Keller continue to evade capture and set about sabotaging the ship, destroying the hyperdrive systems. At the Winter festival the two scientists are still stuck in lockup with Meredith explaining to Daniel the “unfortunate side effect” is the turning of all Pegasus Stargates into WMDs. Soon one of the armoured aliens comes in and takes Daniel with him to their leader. While Daniel tries to convince them to turn off the device but the leader doesn’t care about the collateral damage due to the Stargates. Not able to convince them to stop Daniel questions who they are only for the leader to reveal that they’re Asgard. It turns out this group of Asgard was similar to Loki back in the Milky Way, believing that they should experiment on humans to stop their genetic decay, and see the death of the main Asgard race as proof that the ends do justify the means. Stuck on the city the team are contacted by a Traveler ship led by Katana, a friend of Larrin’s. It turns out that the Travelers had finally set up a colony on the surface of a world only for it to have been destroyed by the planet’s Gate overloading. Katana agrees to take both Sheppard and Zelenka to Ice World so that they can rescue the missing scientists and stop the Attero Device, with Zelenka finding himself working alongside the ship’s 15 year old chief engineer in the engineering room. Back on the now stranded Daedalus Todd begins threatening the hostages if the saboteur doesn’t hand themselves in, leading Keller to do so to distract from the fact Ronon is still onboard. When brought before Todd the Wraith uses a very loose version of the truth in that he’s conducting a mission on behalf of Sheppard. While the sabotage has permanently destroyed weapons control the Wraith are able to get the hyperdrive back online. As she’s escorted to the hanger where the rest of the crew are being held Ronon breaks her out and helps free the crew. 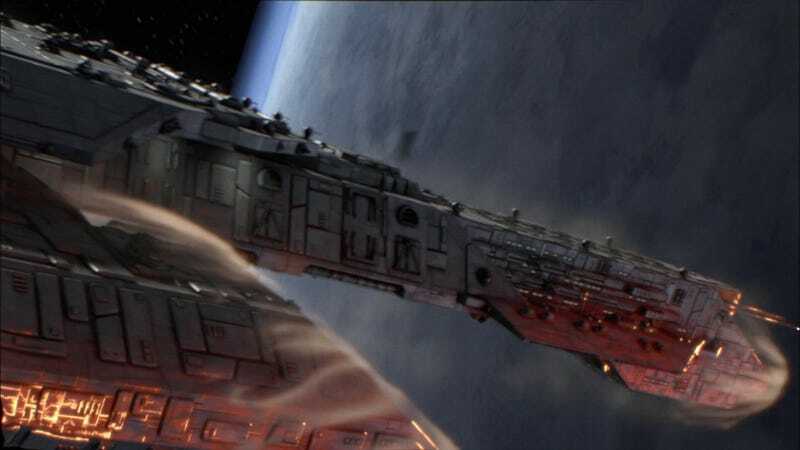 Upon arming up and breaking out however they find the ship deserted with all the Wraith having locked down the controls before fleeing back to their transport, intent on using the Daedalus as a kamikaze weapon. The Geek squad however decide to take matters into their own hands by deciding to destroy the Attero device themselves, finding a spare set of armoured suits to use in the process. Unfortunately the early arrival of the Traveler ship has seen the Asgard lock out the interface they previously used to turn on the device. The Daedalus soon arrives to join the messed up party and finds itself on a collision course straight for the facility. Inside the two scientists work to destroy the main power system for the device directly, turning it off, while up above the Daedalus is saved via a risky hyperspace manoeuvre involving the Traveler ship guiding them through the planet. Before the two ships depart, with the scientists beamed aboard, Woolsey has the facility bombed from orbit just to make sure. Back on Atlantis Daniel is soon returned back to the SGC to properly recovered while Keller tells Ronon she’s completely not interested in him. In a showing that the show can never escape SG-1 we see the return of the Asgard in a new form though according to the behind the scenes stuff it was for budgetary reasons. Here however this is one of the times where the inability to escape the franchise’s past turns out rather well. So yes it turned out that prior to the Wraith-Ancient War the Asgard had attempted to colonise Pegasus, only for the war to cut them off from the home galaxy and instead go along a completely separate evolution path which seems largely to have been slowly using more and more tech on themselves compared to their original counterparts. While that could’ve been the only difference the show instead has a major philosophical split as well that sees this new incarnation do whatever it takes to achieve their goals no matter the cost. This is also given a good degree of complexity as instead of just going “that’s wrong” they’re instead defended by the fact that while it’s extreme it has ensured their survival while the main race has gone extinct due to the fact they refused to try ever avenue of research and ended up killing themselves in the process. On a show that’s been largely dominated by factions that are either good or bad it’s a nice change of pace. Talking of said factions we see Todd and his Wraith continue their place as one of the few other groups with some complexity to them and in this case a confusing situation that turns into an attempt at destroying the Daedalus. It’s interesting to note that his kamikaze plan only happens due to Ronon’s sabotaging of the weapons which Todd likely took as confirmation of the Expedition’s ill intentions towards him. If it hadn’t occurred no doubt he’d have bombed the target from orbit and been about his way. Instead the incident leaves a significant cooling of relations between the two groups as they each overreact regarding actions taken. Much like how it’s a shame this will be the only appearance of the new Asgard faction this is also the last appearance of the Travelers another sorely underused and only advanced human faction the show ever managed to put on screen. Even their small appearance in this two-parters adds notable details to their portrayal as scavengers, living off of cobbled together ships that are slowly falling apart. The young being masters of their field and the very haggard looking equipment only serves this description further in their favour. Of course this appearance wasn’t without fault however with previous foil Larrin not appearing as she was one of the more memorable side characters of season 4. One element the episode finally destroys however is that stupid love triangle subplot that lasted all of two episodes. What a great use of airtime. In the end though the episode remains a great climax to the first part, putting together a lot of ingredients that sadly never get exploited in the future while still maintaining the humour of the previous partnership between Daniel and Meredith. · For a man threatening a hostage Todd looks awfully chummy with Woolsey. · Ronon’s evolved slightly from attacking computers earlier in the season. · Well that love triangle lasted really long. The team are visiting Beckett who is continuing his work treating the victims of the Hoffan plague and the Wraith collateral damage. Just as the team start discussing how things are going the team are alerted that the Wraith are inbound. It turns out that the Wraith are there for the survivors of the Hoffan plague planet that are being sheltered on the planet, wanting to cut down on the tainted stocks before they spread further around the galaxy, with the Wraith willing to leave the others alone. The team offer to evacuate the village but some in the village want to instead offer the survivors up as requested by the Wraith. When the number of Wraith guarding the Stargate begins to grow, preventing evacuation, the collaboration faction grows in number and begin rounding up the survivors themselves. When the team attempt to evac the most vulnerable survivors and Beckett the collabs attempt to take them hostage but are forced to surrender by the team. A group who had already been sent to the Wraith however begin to realise they’ve been betrayed and one of their own number decides to betray Beckett out to the Wraith in exchange for his own life, leading to the Wraith capturing both Beckett and Meredith in the clinic while they pick up supplies, but the Wraith kills the informant anyway due to his survival of the plague. Onboard the Wraith Hive the two doctors soon wake up and are brought to a lab to begin work on fixing the plague problem for the Wraith. The Wraith leader offers the lives of everyone on the planet in exchange for creating a way to detect the plague in people. Beckett however struggles with quandary of either letting the Wraith hunt down and kill those afflicted with the plague now or helping them and thereby reallowing open season on all humans. Beckett goes to see the leader in private and enrages the Wraith by telling him he won’t do it. The leader decides to feed on the doctor only to die in agony as Beckett was infected with the plague previously. Taking the leader’s stunner Beckett helps him and Meredith break out, destroying the Hoffan research in the process. While looking for an escape plan Meredith makes contact with Sheppard via radio only to be told to take out the Hive’s weapons first so they can all escape. Despite the Wraith being alerted to their presence Meredith manages to do so before fleeing to the Dart bay. As if things weren’t bad enough however the leader of the village suddenly pulls a betrayal, turning collab and freeing the others from jail who promptly inform the Wraith of where the survivors were being kept in a nearby mine and marching there. When they arrive however all they find is a load of C4 waiting for them. It turns out the village leader was playing the collabs from the start and had now helped clear the way for the evacuation of both the survivors and the rest of the village. Just as they reach the Gate the Wraith begin sending Darts from the Hive only for one to accidentally beam out Meredith and Beckett, having juryrigged a free ride, before they all escape. On Atlantis Beckett and Meredith head to lunch only for Beckett to begin interrogating Meredith about this person he likes. What a mess of an episode that was. The entire view of Outsiders can be boiled down to that to be honest. The first real Beckett episode for a while now and what we get is this overdone story where it’s never really clear what the hell is going on. Let’s start with the villagers and the whole “enemy within” storyline. This is far from the first time the franchise has tried this, doing the same sort of story at least twice on SG-1 before with the Goa’uld in season 6 and then the Ori in season 10. If it weren’t just for the story being largely tired in concept the show adds to the problems by then trying to spice it up with everyone betraying each other at a moment’s notice. It’s hard to root for characters who sell each other out every 5 minutes. By the end of it I was pretty much thinking “sod the village, just nuke it yourselves Expedition”. Why they chose to then divide the episode between the already tired and messy A story and then a B one involving Beckett I also do not get. Beckett hasn’t really had a Beckett centric episode since The Seed and clearly they didn’t know what to do once they brought him back given this is only his second appearance since then and here he’s once again at a loss for things to do. Yes he has his rather callous moment of killing the Wraith leader quite brutally but other than that his role in the plot is pointless. It’s really just more reason they shouldn’t have brought him back. A real clunker of an episode that’s badly paced, a mess plotwise, and tries to put characters at the centre who don’t really have anything to do once there. · God it’s like a betrayal off. · No one notices that guy switches from a rifle to a shotgun?